Players are scholars and scribes poring over (studying, scribbling, erasing, more scribbling) an ancient manuscript. 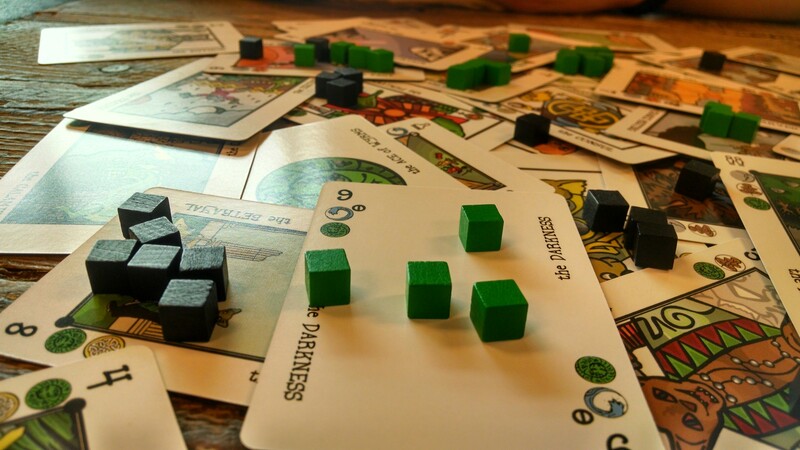 By playing cards to the free-form play area and then placing worker cubes on them for control, they hope to have their work be recognized by the Queen at story time. Shuffle the deck, deal five cards to each player, and flip one face-up to the middle of the table as the root of all knowledge. The game works well with just the basic deck; extended card details are given below. On your turn, you must play a card and draw a card. The card you play must touch at least one other card as well as the table (you can't just cover cards up). All touched cards are called "adjacent." If any adjacent cards have at least as many scribes as the rank of the card you just played, and their rank was visible before you played this card, score them. Aces score all adjacent occupied cards. The player with the most scribes on that card scores its rank, and the player with the second-most scores half its rank, rounded down. Cards without rank (or whose rank is no longer visible) cannot be scored nor trigger scoring (other than the Ace, as noted). In the case of a tie, tied players all score half rank. Finally, look at each adjacent card's suits and count all the suits that match your played card. Place that many scribes on any adjacent card(s). There is no limit to the number of scribes on a card. The game ends when: a player runs out of cubes // the deck runs out of cards. Score all cards whose rank is still visible once more. The player with the most points wins. The Excuse has no suits and no rank; it cannot trigger scoring nor place scribes. Instead, take all the scribes from one card you occupy and place them on one other card. The Pawns have no rank, they cannot trigger scoring. Place scribes as usual. The Courts have no rank, they cannot trigger scoring. Instead of placing scribes, remove scribes from adjacent cards equal to the number of matching symbols there. These scribes do not need to be your own. The Crowns have no rank, they cannot trigger scoring. Instead of placing scribes, move scribes from adjacent cards equal to the number of matching symbols there to adjacent cards (touching the origin card). These scribes do not need to be your own. None, though one is planned with a custom deck. Sanity Checks and Suggestions: Kenny VenOsdel, Nate Straight, Greg James, Sverre Rabbelier.